After more than two years of consideration by a large community task force formed for the purpose of examining the issues around our current student assignment system, the staff is now prepared to present for Board discussion and approval the manner in which we intend to assign students to Berkeley Unified School District elementary schools. In 1968, Berkeley Unified voluntarily integrated all schools. Our commitment to this important and precious legacy continues to be a primary value in our community. Forty years ago, our primary goal was to racially integrate all schools. Although it is indisputable that each student’s racial and ethnic background enriches the learning environment of all students, we believe that the recognition and appreciation of the bedrock value of diversity in our schools should be expanded to consider additional factors that enhance the learning environment and recognize other factors contributing to diverse classrooms. These additional factors have independent significance separate and apart from racial and ethnic diversity. We believe that assigning students using a multi-factor approach enriches the educational experiences of all students, advances educational aspirations, enhances critical thinking skills, facilitates the equitable distribution of resources and encourages positive relationships across racial lines. Accordingly, staff now proposes to include parent income and education levels as factors in addition to race as a means of expanding the definition of diversity and creating even greater equity among our schools. The new proposal will continue to utilize aspects of the current student assignment plan: parental choice, sibling priority and attendance zones. Berkeley Unified School District believes that the level of a parent’s education is a key indicator of how a student will perform in school. We recognize that students from households whose parents possess college or advanced degrees have more developed literacy and academic skills when they enter school. A 1999 article by the College Board states: “In one large national study, only 5 percent of the eighth graders whose parents did not have a high school degree had achievement test scores in the upper quartile, whereas over half of the students who had at least one parent with a graduate degree scored in the top quartile .” We know that well-educated parents assist their children in succeeding at high academic levels. Such help ranges from reading to their children, assisting with school homework, visiting libraries, hiring private tutors, persuading educators to place their children in advanced courses and researching for colleges and universities that might be well suited for their children’s abilities. On the other hand, parents with limited resources may lack the necessary skills to provide a comparable level of support. Moreover, broadening the discussion of parent education level, the renowned sociologist Pierre Bourdieu uses the term “capital” beyond its economic conception, to include non-economic forms of capital, specifically cultural and symbolic capital. He contends that different types of capital can be exchanged, acquired, and converted into other forms. The term “cultural capital” represents the accumulation of non-economic forces such as family status, social class, and commitment to education among those components that influence academic success. Bourdieu emphasizes the importance of books, paintings, museums, travel, instruments or exposure to machines (for example computers) in bringing success to a student’s future. He argues that educational attainment depends heavily on the cultural capital previously acquired by the subject’s family. Other social reproduction researchers allege that little mobility exists among social classes. Jay MacCleod states: “Several decades of quantitative sociological research have demonstrated that the social class into which one is born has a major influence on where one will end up. Although mobility between classes does take place the overall structure of class relations from one generation to the next remains largely unchanged .” Consequently, a school system must strive to ensure continued equity in its schools, particularly in a community like Berkeley where the economic and parent education levels are so varied and are subject to change relative to housing markets, the state economy and the influence that UC Berkeley exerts in our community. The academic performance of the student population in Berkeley might serve to illustrate the social reproduction theory. As we study patterns of student performance in Berkeley, we find that parent education influences how well students perform in standardized tests. For instance, we found that students who live in East Berkeley are more likely to score higher on tests than students who live in West Berkeley. Progressive scholars have argued that cultural values do not necessarily determine behavior or success in life. Rather, cultural values arise from social stratification forces and reflect one’s social class. Thus, if a group projects limited aspirations or fails to recognize the importance of higher academic achievement, it is not because of different cultural values but because of limited opportunities. By including parent educational level in the student assignment process, Berkeley Unified School District seeks to distribute educational “capital” amongst the elementary schools and maximize the educational opportunities for all students. (See parent education by planning area in the Appendix). Thus, having schools that only attract students from the surrounding neighborhood could adversely affect both curriculum and the perception of a quality environment. 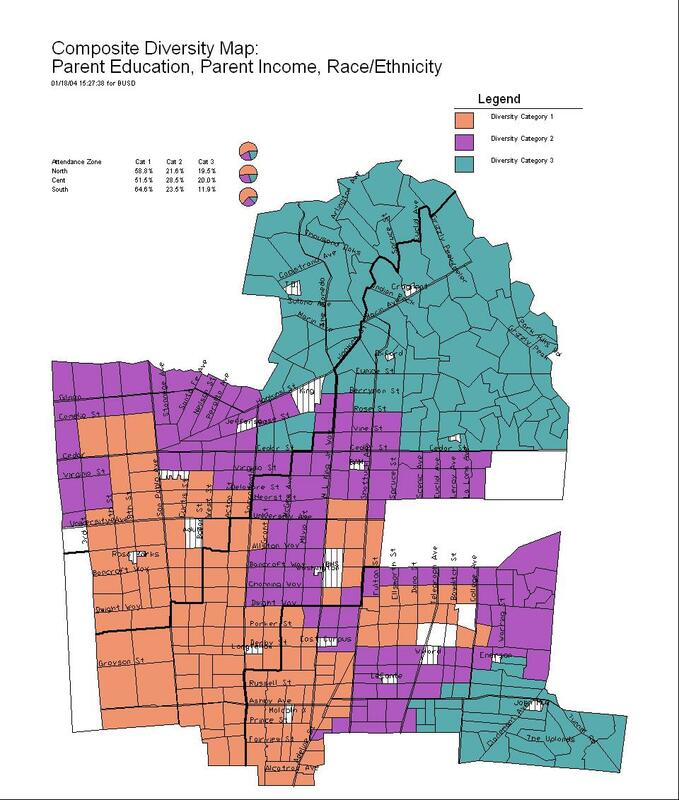 For instance, Rosa Parks and Oxford Schools are very close to the District’s desired racial diversity but are very different in their student demographics relative to parent education and income levels. Since the state of California and the federal government are penalizing or negatively labeling schools based on a single test measurement, it is incumbent on our structures to ensure that each school has an equal chance to excel on all test measurements, since failure to do so can be detrimental to the schools’ reputation. Berkeley Unified School District believes that the economic background of students is of paramount importance. Consequently, we believe that including parent income in our student assignment plan enhances diversity at our schools. Any heavy concentration of poverty in a given school creates inequities because of the inabilities of families to purchase goods and services that can support the learning process. When individual schools have greater access than others to fundraising activities, supportive programs and instructional materials that draw from the financial resources of its parents or neighborhoods this can create conditions of inequity. Consequently, a school district should attend to those rules and processes that inadvertently create inequitable school environments. Researchers have found that a high concentration of poor students in schools is associated with low academic achievement for both poor and wealthy students alike. Thus, all students do better when school ratios are more balanced. 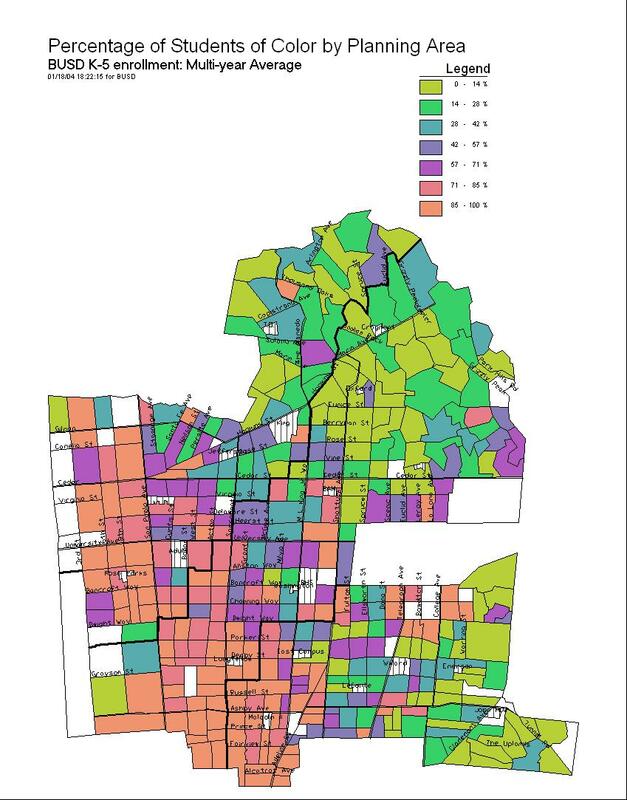 In the City of Berkeley, race and social class have traditionally segregated residential housing patterns. Gary Orfield, a Harvard professor and researcher, contends that when African American and Latino students reside in predominately minority neighborhoods and attend only their neighborhood schools, they are very likely to then attend economically as well as racially segregated schools . Statistics tell us that these minority-segregated schools are more likely to experience a higher concentration of poverty. Moreover, students in these schools are likely to perform poorly on tests; highly qualified teachers are more difficult to recruit and retain, and consequently poverty stricken schools are less likely to offer the rigorous courses required for admission to colleges and universities . The opposite is true for schools whose parents have higher educational levels and greater wealth. Therefore, because of housing patterns in Berkeley this would also mean segregated white schools and segregated minority schools. Our own data indicate that for the most part student test scores tend to reflect the economic solvency of their parents. As we examined our data we found that affluent children tend to score higher on tests than less affluent students. Therefore, including the parent income level in a student assignment plan guides us closer in our goal of creating equity amongst our schools and providing a supportive learning environment for all students. (See parent income by planning area in the Appendix). Gurin suggests that democracy in the United States is characterized by homogeneity and common identity, where people of common backgrounds and beliefs come together, rather than by diversity, where heterogeneity of backgrounds, perspectives, and identities predominate. In the latter type of democracy, groups need to forge alliances that respect competing perspectives… The leaders of today need skills that permit them to work effectively in heterogeneous environments. These skills include perspective-taking, acceptance of differences, willingness and capacity to find commonalities among our differences, acceptance of conflict as normal, conflict resolution, participation in democracy, and interest in the wider social world. Consequently, because our goal is to teach students how to thrive in a multi-cultural and multi-racial society, our ability to impart these skills in a diverse environment becomes of paramount importance. Students in these environments are more likely to experience “enhanced learning, higher educational and occupational aspirations, and positive social interaction among members of different racial and ethnic backgrounds .” The benefits of diverse environments enrich not only racial and ethnic minorities but white students as well. Patricia Gurin found that white students in racially diverse classrooms were more likely to score higher on complex analytical tests, possess greater intellectual confidence, desire to pursue graduate degrees, understand and appreciate the ideas of others, and were more likely to maintain and pursue friendships across racial and ethnic lines. 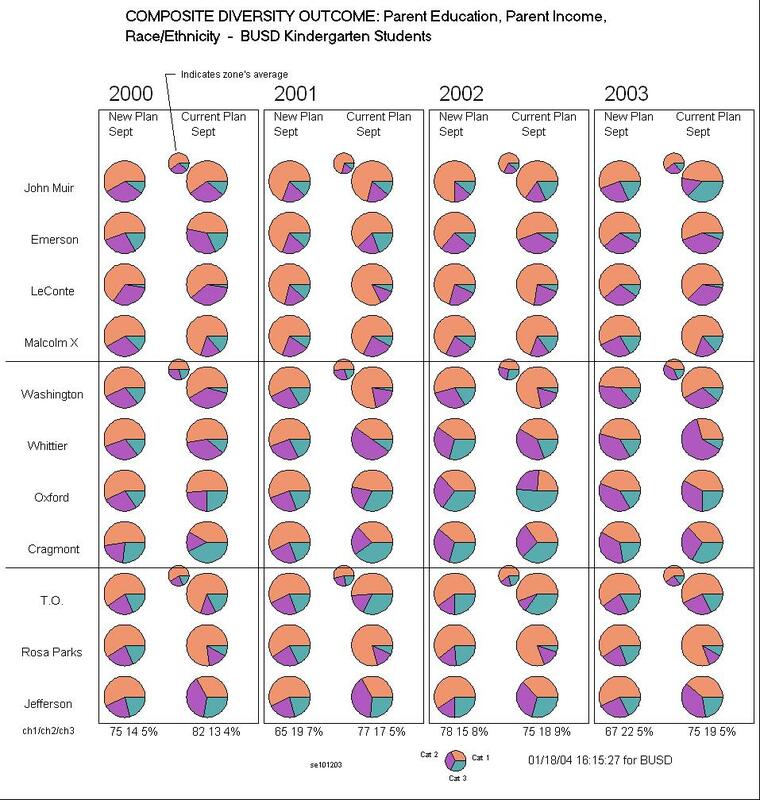 One of the justifications for considering the diversity factors in the student assignment plan is the extent to which these factors will contribute to school site equity. One of the measures of success of the student assignment program will be the extent to which schools offer a comparable education to the students enrolled at each site. Of course this does not mean each site must be identical since individual schools assume distinct and unique characteristics. However, each of these distinctive schools will share the equal responsibility of meeting the educational goals for achievement that apply to the District as a whole. In such a learning environment choosing or attending one school rather than another will confer neither significant advantage nor disadvantage to pupils enrolled at any individual site. The establishment and identification of a “base” program required by all schools ensures that equity without diminishing the unique qualities of a given school. Equally important is attaining the goal of a faculty that parallels the diversity represented in the student body. This may be difficult to implement for a number of reasons such as the applicant pool, recruitment and outreach, retention problems, etc. Nevertheless, this is an important goal as well as a crucial part of site equity and our employment practices will strive to support this endeavor. Summary For the reasons mentioned above, the Superintendent and staff recommend the approval of expanding the student assignment system to include the three outlined diversity factors. Should the Board approve these components, the attached document details the mechanics and process that will be used to implement the student assignment plan. STAFF RECOMMDATION: Receive for Approval the Student Assignment Administrative Regulations. The goal of the new elementary student assignment plan is to integrate schools by utilizing (i) parent education level, (ii) parent income level and (iii) race and ethnicity. To accomplish this goal, we created a composite diversity map that takes into consideration these three diversity factors. The parent education and parent income diversity factors were developed from data available from the 2000 US Census. The race and ethnicity factor was developed from multi-year data drawn from the K-5 student population in Berkeley Public Schools. Our student assignment lottery will no longer rely upon the actual personal attributes of students. Rather, each student will receive priority based on a composite of attributed diversity characteristics derived from the planning area in which the student lives. 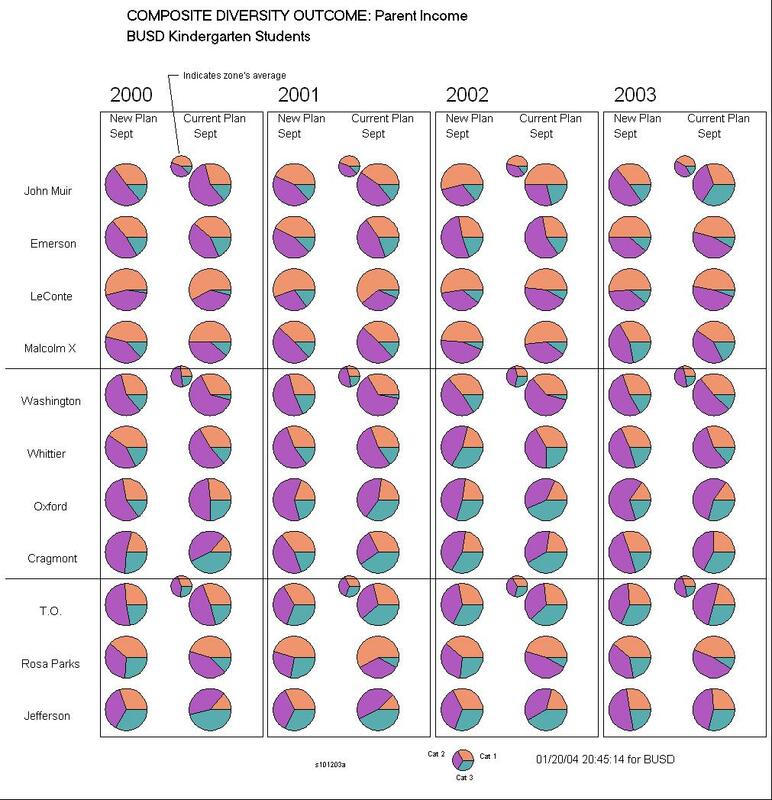 This new proposal will continue to utilize certain aspects of the 1995 student assignment plan: parental choice, sibling priority and attendance zones. In addition, the same methodology will be implemented in assigning students to all elementary schools; magnet schools will not use a separate student assignment system as in the past. Choice will continue to be an integral part of the student assignment plan. The District will continue to encourage parents to learn about the elementary schools through forums like the kindergarten fair, the school kindergarten nights, school visitation hours and outreach to for profit and non-profit pre-schools. Parents will continue to submit a “parent preference form” where they will rank their school choices as “first choice,” “second choice” and “third choice.” The District will process the parent preference forms in accordance with the parents/guardians’ choices. Berkeley Unified School District is committed to maintaining school sibling priority. Thus, the District will continue to honor such requests to the extent possible based on space availability. The Northwest Zone consists of Jefferson, Rosa Parks Environmental Science Magnet and Thousand Oaks Arts and Technology Magnet. The Central Zone consists of Berkeley Arts Magnet, Cragmont, Oxford and Washington Communication and Technology Magnet. The Southeast Zone consists of Emerson, John Muir, LeConte Science Magnet and Malcolm X Arts and Academics Magnet. Each diversity category (1, 2 or 3) is derived from this “weighted average” by applying two thresholds or “break points” to the decimal value. The breakpoints were determined after multiple experiments and careful considerations. The breakpoints were chosen to divide the city’s K-5 population into three proportions. The following is an example of computations for three planning areas. The locations of areas 34, 231 and 239 can be seen on the map found here. Utilizing the three composite diversity categories, students will be assigned proportionately to elementary schools. As noted above, the actual personal attributes of students will no longer be relied upon in determining student assignments. Rather, the lottery will give priority based on the attributed diversity characteristics derived from the planning area in which the student lives. Based on his or her attributed diversity characteristics, each student will fall into one of three composite diversity categories. Priority will be given based on these composite diversity categories. 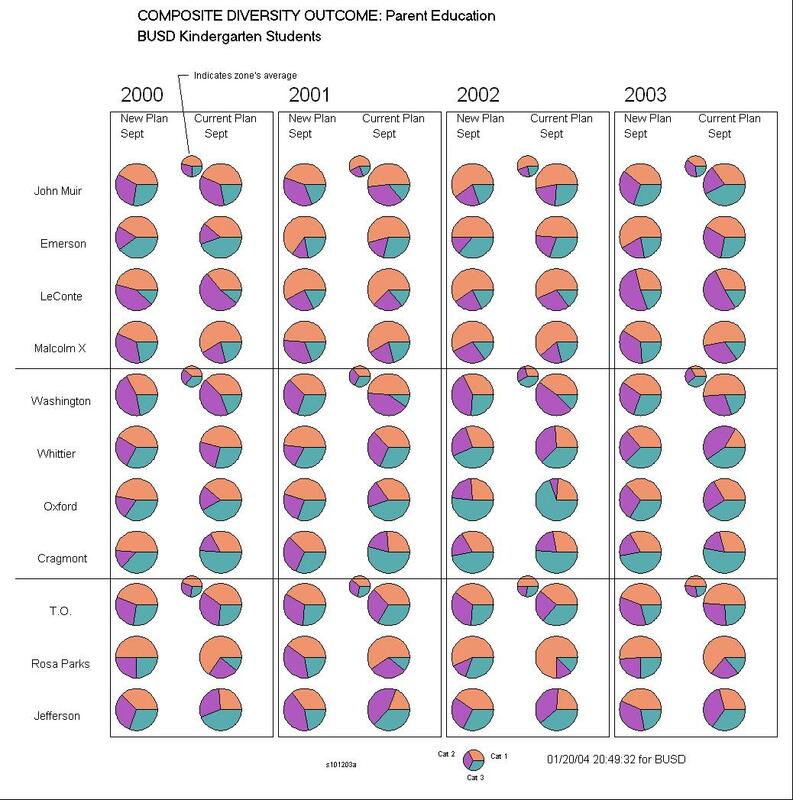 It will continue to be an important administrative function to monitor each school’s diversity composite throughout the student assignment process (See composite diversity outcome: parent education, parent income, and race and ethnicity; composite diversity outcome: parent income; composite diversity parent education; composite diversity outcome: race and ethnicity in the Appendix). After students have indicated their school choice and are placed by lottery, it may be necessary, in some instances, to resort to a “safety valve” by which we would manually assign a student to his or her alternate choice should there be an imbalance in any of the three factors that is outside the plus or minus 5-10% range of flexibility. We expect to use the “safety valve” method of readjustment very rarely, if at all. We believe that retaining some means of discretionary administrative intervention will ensure that student needs for special programs, staffing variations, school seating capacities or late enrollments are compatible with the student assignment plan. In October of each year as the District prepares the State required CBEDS report, an accompanying document will be included which will inform the Board of each school’s diversity balance as an additional means of monitoring the implementation of the Assignment Plan. Each year in preparation for kindergarten enrollment, sensitivity will need to be given to the analysis of developing trends or significant shifts in housing patterns or community development projects that may alter the makeup of a given planning area. The supporting software allows for modifications should these circumstances occur over time. Staff would then bring to the Board proposed revisions to the plan in order to maintain the policy goals. The City of Berkeley is a community rich in its diversity. This can be measured by the various racial, ethnic, economic, educational, and linguistic backgrounds of the population that inhabits the City. Therefore, it was not surprising that in 1968 the Berkeley Unified School District became the first major school system to voluntarily integrate its schools. 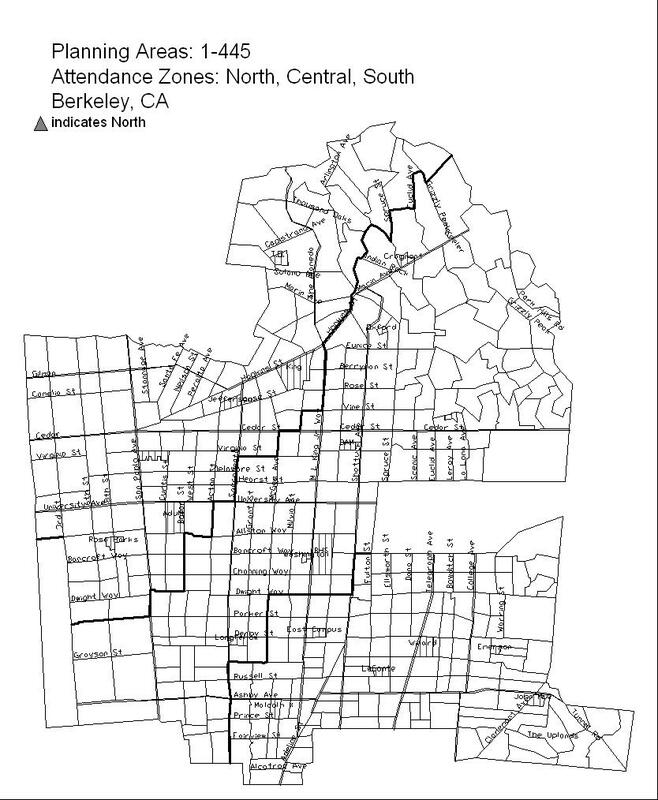 The District initially implemented a school desegregation system by using “paired schools” and instituted a mandatory “two-way busing system.” Under this plan the District transported students from the predominately non-white West Berkeley to the predominately white East Berkeley for kindergarten to third grade and East Berkeley students to West Berkeley for fourth to sixth grade; thus, eliminating school segregation created by the de-facto residential segregation within the City. Following the commitment to further desegregate the junior high schools, the District created two junior high schools that served students in grades seventh and eighth. The junior high school boundaries were drawn in a manner that would ensure racial integration in the two schools and again cut across City boundaries. 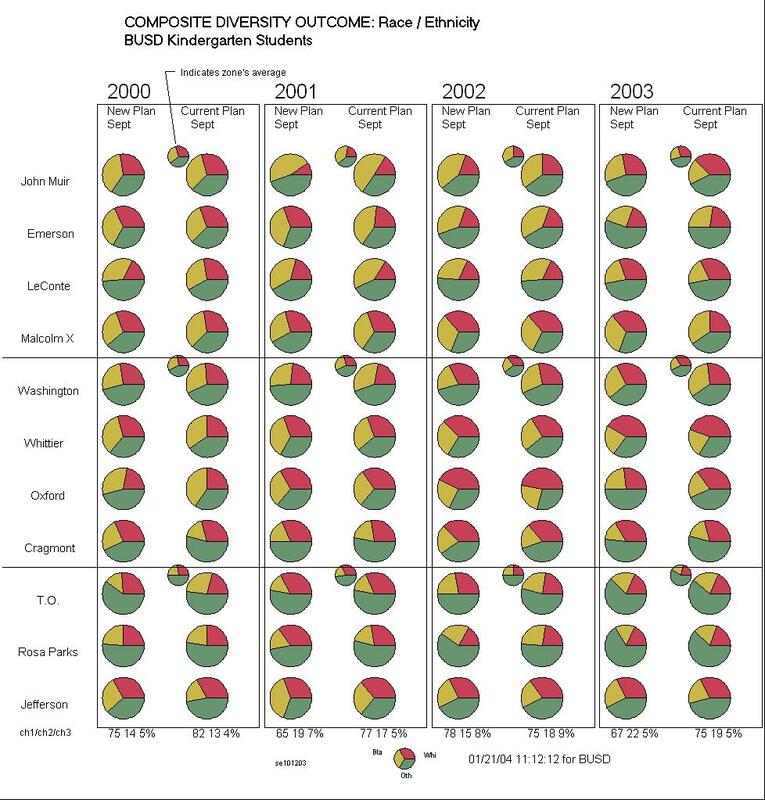 Over time, because of demographic changes within the City’s population, the budget constraints which required the closures of schools and the resultant shifting of attendance patterns, several schools became racially imbalanced. Additionally, many parents and teachers had expressed concern about disruptions that occurred with the “paired school” plan requiring students to change schools after the third grade. Thus, these factors necessitated the development of an alternative integration plan. In 1995, after six years of evaluation and community discussions, the schools were reconfigured using a K-5 Elementary and 6-8 Middle School model. To that end, the School Board adopted a “controlled choice” student assignment system. 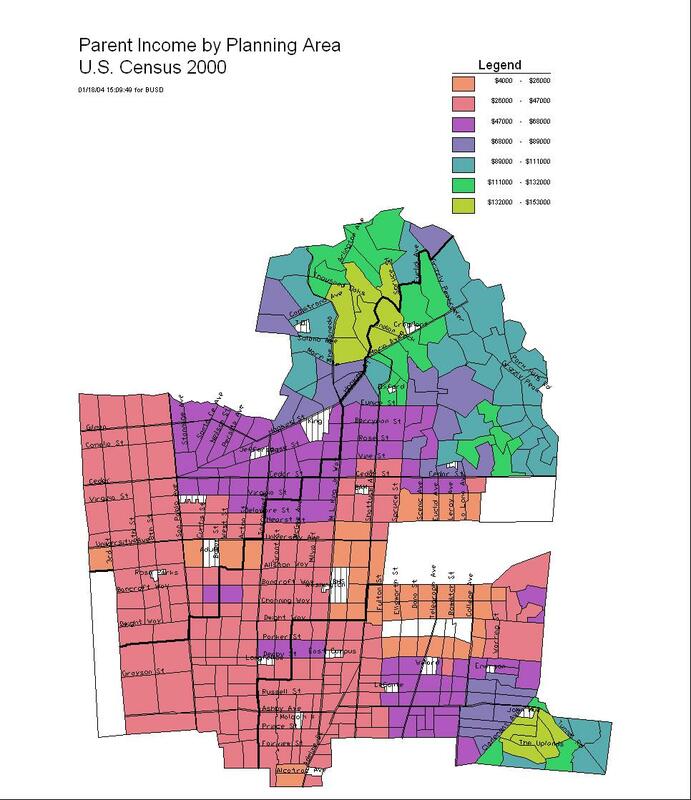 The goal of the controlled choice plan was to give families a choice of schools within one of three zones and requiring each school within the zone to meet the zone-wide racial proportions of three racial categories: black, white, and other ethnicities, at a ratio of plus or minus 5%. As a result of the changing legislation in California, in September of 2000, the Superintendent, Jack McLaughlin, convened a Student Assignment Advisory Committee. The Committee’s charge was to develop two alternative assignment plans at the elementary level: One including the use of race and one with factors excluding the use of race. Following a public forum the Committee recommended retaining the existing controlled choice student assignment plan. The Board elected to maintain the existing plan. However, throughout the following year the Committee continued to meet and discuss equity in our schools and race neutral factors to create school diversity. During that same year the Committee was asked to formally address the earlier charge of a student assignment plan that expanded the definition of diversity and one that did not use race as a factor. A progress report and a preliminary proposal, requiring no Board action, were presented for discussion. Again, community input was sought and opinions were expressed regarding the merits of the components of this preliminary plan. The Board indicated areas they felt needed greater development and asked staff to continue their work. Since that date, further study and refinement have been done and the staff is now prepared, based on the work of the Committee, to present both a policy and program components of a student assignment system. Now, in preparation for the coming year, it is time once again to consider the means by which we assign students. Tonight, the Board is asked to consider adopting a new policy and a new system for assigning students. Attached is the proposed Board Policy that establishes the philosophy and goals on which the Student Assignment System can be based. Although the Board has previously approved a resolution indicating their beliefs and desires, staff is recommending a formal policy be adopted in keeping with our new policy adoption procedure. STAFF RECOMMDATION: Accept for second reading and adoption the proposed policy for the establishment of a District Student Assignment System and Criteria. Berkeley Unified School District believes that diversity in our student population enriches the educational experiences of students; advances educational and occupational aspirations; enhances critical thinking skills; facilitates the equitable distribution of resources; reduces, prevents or eliminates the effects of racial and social isolation; encourages positive relationships across racial and economic lines by breaking the cycle of racial hostility to foster a community of tolerance and appreciation of students from varied and diverse backgrounds; and promotes participation in a pluralistic society. Berkeley Unified School District believes that our commitment to these ideals is a strongly held community value and as such, we are committed to ensuring that policies, processes and educational programs that promote the values of socio-economic and racial diversity will be designed and implemented. Further, Berkeley Unified School District believes that free and public education is the right of all the children of Berkeley, hence, at each and every school a quality education shall be provided that ensures equal opportunities for all students to be taught a strong core curriculum, participate in enriched learning experiences and receive resources that promote success for all students. To advance these values, the District’s Student Assignment Plan must be developed to ensure that that each elementary school’s student population, within an identified zone, reflects the diversity of the student population attending District elementary schools within that zone. Such a plan should be developed that achieves the goal of socio-economic and racial diversity with a target range of plus or minus 5-10%.